Study after study shows that kids need proper fitting backpacks to avoid muscular back pain, as well as lower back pain. If you head to your local store, you will see that most manufacturers ignore these findings and continue to make ill fitting backpacks that are too large for smaller students. Finally there is a manufacturer, Sydney Paige, that thinks about our children and puts their needs first. Sydney Paige makes the BEST Backpack for Your Student. As summer comes to a close, parents are hunting for school supplies, backpacks and new outfits for the start of the school year. This year, parents can not only get a great looking backpack for their child but one for a child in need as well. Sydney Paige will donate one backpack to a child in need for each backpack purchased. Parents can even pick the charity the donated pack will go to. Sydney Paige backpacks are eco-friendly and offer fun geometric designs in bold colors. Backpacks are equipped with multiple compartments. The backpacks are spacious, without being excessively large. Sydney Paige backpacks have a padded back and ergonomic shoulder straps. Say “no” to the one size fits all backpacks, they might seem inexpensive but they are low quality and have poor ergonomics. The Little Learners backpacks are perfectly sized for preschoolers starting their education adventure. Featuring a large compartment loaded with pockets and decorated with adorable creatures. The Young Explorers backpacks are suitable for early elementary students who are not quite tall enough for the bigger bags. Features include padded backing and shoulder straps, and reflective piping for safety. The World Changers is great for older children. These laptop backpacks have storage room, extra compartments and accessories holders. Padded with a reinforced bottom, large compartment and easy access double zipper. Parents, Sydney Paige did not forget about you! The Difference Makers laptop rucksacks are stylish and have a fleece-lined padded laptop sleeve and external accessory pockets. If you are looking for a quality backpack that fits properly, feels great to carry, and looks stylish then look no further than Sydney Paige. Last year we made the mistake of getting a cheap character backpack (left), it was way to big for my little first grader. It was uncomfortable and broke within the first couple months. After a second one, we bought a nicer quality backpack (center) but it was still too big for her small frame. This year we wised up and went in search of a backpack designed for a child her age (right). 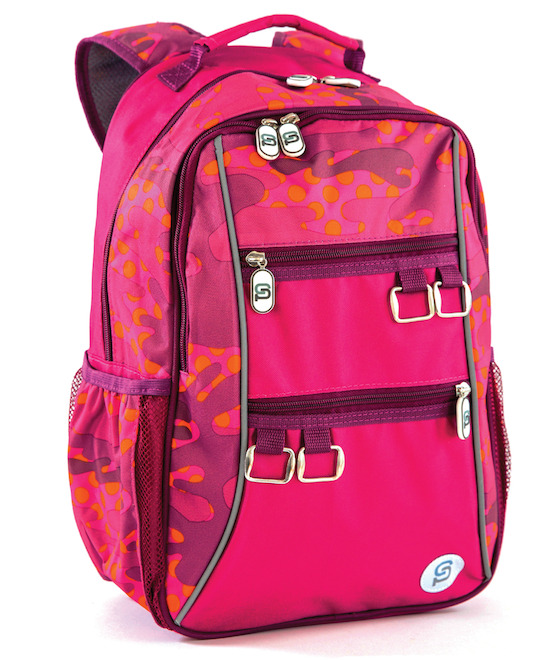 See how well the Sydney Paige pink camo Valencia backpack fits, not too wide across the back. It sits across her shoulders and does not sag, thus reducing strain on her back muscles. I love how well it fits, she loves all the accessory holders and pockets.